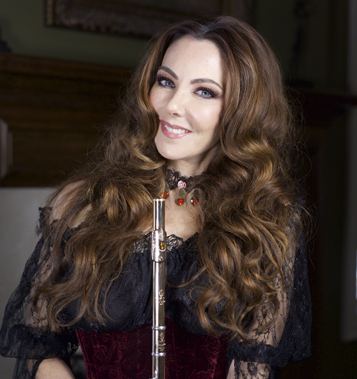 Michele McGovern is a musician, composer/arranger, and award winning flutist and film maker. She was awarded full scholarship for both her Bachelor and Master's Degrees in Music Performance from the Chicago Musical College of Roosevelt University. She was a first place winner in several competitions and a two-time recipient of the Farwell Award for musical excellence from the Musicians Club of Women. Ms. McGovern's debut album, "Falling Leaves" will be released on Centaur Records Label in early 2017. Falling Leaves is a collection of the latest original music by the international flutist Michele McGovern. Composed in collaboration with Tiko Lasola, Chris Kukla, and Gary Guttman, Falling Leaves takes the listener through a cinematic journey with sounds harvested from classical, jazz, rock, new age, and pop genres to create a truly mesmerizing experience. Michele's music may remind you of the Piano Guys, Lindsey Sterling, 2 Cellos, and Yanni, but with her and her flute taking center stage. Her latest adventure to bring flute to mainstream listeners includes a prologue performance of the new musical Lady Vadula. Ms. McGovern's has had solo appearances with orchestras including the Mozart's D Major Concerto, Mozart's Andante, Vivaldi's il gardellino Concerto,Vivaldi's La Notte Concerto, Bach's Brandenburg Concerto No. 4 for two flutes and violin (with Flutist Mary Stolper and Violinist Rachel Barton Pine), Lukas Foss' "For Toru" (Lukas Foss conducting) and in the McGovern/Lord orchestral arrangement of Carmen. In 2001 she was invited to record as a soloist with the Saint Petersburg Camerata in St. Petersburg, Russia. Michele performed and arranged music with pianist Melody Lord for over 12 years. A highlight was performing all 6 of their arrangements in New York City's Carnegie Hall in the Weil recital hall. As an orchestral and chamber musician Ms. McGovern performed with The Nutcracker Ballet, Chicago Sinfonietta, and was Principal Flute with the Lincolnwood Chamber Orchestra for over 15 years. She studied with Jean Berkenstock (former principal Lyric Opera Orchestra), Alexander Murray (former principal London Symphony), Donald Peck (former principal Chicago Symphony), Mary Stolper (Principal Grant Park Symphony), and was also a piano student of Melody Lord. She is a board member of The Musician's Club of Women, a member of The Union League Club, and an Artist-in-Residence with American Music Festivals.